You please Allah. You are obeying the commands of your Lord when you wear the hijab and you can expect great rewards in return. It is Allah’s protection of your natural beauty. You are too precious to be “on display” for ach man to see. It is Allah’s preservation of your chastity. Allah purifies your heart and mind through the hijab. Allah beautifies your inner and outer countenance with hijab. Outwardly your hijab reflects innocence, purity, modesty, shyness, serenity, contentment and obedience to your Lord. Inwardly you cultivate the same. Allah defines your femininity through the hijab. You are a woman who respects her womanhood. Allah wants you to be respected by others, and for you to respect yourself. Allah raises your dignity through the hijab. When a strange man looks at you, he respects you because he sees that you respect yourself. Allah protects your honour 100% through your hijab. Men do not gaze at you in a sensual way, they do not approach you in a sensual way, and neither do they speak to you in a sensual way. Rather, a man holds you in high esteem and that is just by one glance at you! Allah gives you nobility through the hijab. You are noble not degraded because you covered not naked. Allah demonstrates your equality as a Muslim woman through the hijab. Your Lord bestows upon you equal worth as your male counterpart, and gives you a host of beautiful rights and liberties. You express your acceptance of these unique rights by putting on the hijab. Allah defines your role as a Muslim woman through the hijab. You are a someone with important duties. You are a reflection of a woman of action not idle pursuits. You display your sense of direction and purpose through your hijab. You are someone that people take seriously. Allah expresses your independence through the hijab. You are stating clearly that you are an obedient servant of the Greatest Master. You will obey no one else and follow no other way. You are not a slave to any man, nor a slave to any nation. You are free and independent from all man-made systems. Allah gives you the freedom of movement and expression through the hijab. You are able to move about and communicate without fear of harassment. Your hijab gives you a unique confidence. Allah wants others to treat you – a Muslim woman – with kindness. And the hijab brings about the best treatment of men towards you. Allah wants your beauty to be preserved and saved for just one man to enjoy – your husband. Allah helps you to enjoy a successful marriage through wearing hijab. Because you reserve your beauty for one man alone, your husband’s love for you increases, he cherishes you more, he respects you more and he honours you more. So your hijab contributes to a successful and lasting marriage relationship. 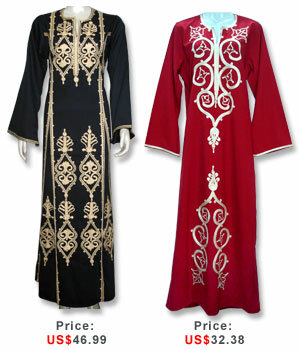 This entry was posted in Uncategorized and tagged abaya, caftan, galabeya, home Islamic clothing, jilbab. Bookmark the permalink. 20 Responses to Why should I wear the Hijab? After examine just a few of the blog posts on your website now, and I truly like your way of blogging. I bookmarked it to my bookmark website checklist and shall be checking back soon. Pls check out my web site as properly and let me know what you think. Impotent gents by no means had it so good. Viagra pioneered the oral procedure for Erectile Dysfunction. Plus the baton, it appears, is transferred to Cialis. In between, Levitra also created its existence felt. But Cialis may be the foreseeable future drug containing the planet on its ft. I simply want to tell you that I am all new to blogging and site-building and certainly loved you’re web page. Probably I’m likely to bookmark your blog post . You actually have good stories. Thanks a lot for revealing your web-site. Goods on the market I’m attempting to find! To ensure the the key accomplishment widziaĹ‚me in life. Awesome web site, will there had been additional these blog posts much more single. Hi there, I must compliment the actual creator in the website for nice design and style, as well as the article author informed comprised an unbelievable complete this way. That is some thing amazing, while since i have examine a real fantastic post. I must convey my appreciation for your generosity in support of those individuals that require help on in this matter. Your very own commitment to passing the solution along came to be unbelievably productive and has truly empowered associates much like me to achieve their dreams. Your amazing insightful advice can mean this much a person like me and extremely more to my office colleagues. Best wishes; from everyone of us. Hi, i believe that i saw you visited my site so i came to “return the want”.I am attempting to find issues to enhance my site!I assume its adequate to make use of a few of your ideas!! Pretty! This has been an very magnificent item. Many gratitude for providing this information. Thanks for all of your labor on this site. Kim delights in engaging in internet research and it’s easy to see why. Most people notice all relating to the powerful form you offer simple suggestions on your web site and improve participation from other people on this topic while my child is without question understanding a lot. Take advantage of the rest of the new year. You’re the one conducting a pretty cool job. Thanks for the good writeup. It actually was a leisure account it. Look complex to more added agreeable from you! By the way, how can we keep up a correspondence?